Google’s Chromecast dongle has now arrived in the UK, with Google selling the HDMI media streamer direct via Google Play right now. The price is £30 or £33 once the surprisingly reasonable for a change £3 shipping is added on, which isn’t too bad — although several men will be along shortly to leave comments saying they bought the US version for less two months ago. And there’s proof. Exciting if it fits your media consumption patterns, plus a custom iPlayer app is on there just for us. Damn. I’m quite tempted by that. But I have no idea why. Bought mine first thing this morning. I’ve been waiting for the official UK release, not least because I suspected we wouldn’t see iPlayer support until it happened. where did you buy yours from? PC world or have you just ordered one from Google? All 35 had sold out by 10:30 in local high street Currys (£30). Luckily, they had more coming in by the afternoon so the lady behind the counter gave me one of the ones already reserved for click and collect as there were 11 locked away there. Impressed so far, setup was simple, still can’t quite work out how it discovered the device on my wireless and then passed the wifi password to it from the discovery app. iPlayer worked straight away, google music happily played tracks and showed album art. I couldn’t figure out how to display pictures though. I’d assumed the Gallery or Photo apps would have been updated to have the “cast” icon. When you set it up it disables your wireless for a few seconds, so I reckon it uses WiFi direct to discover your chromecast and send it your local wireless info. 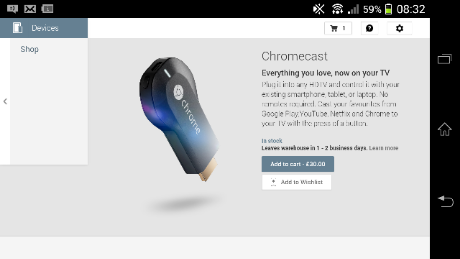 You need to download the app, allcast to be able to stream pics & videos to chromecast… though yh i gather at some point in the future the gallery app will be updated to support casting, though most people dont have a nexus so the gallery depends on what phone you have, i doubt samsung will be updating their gallery app to include casting.. I downloaded Plex Media Server over the weekend and already have that working with the PS3 in the living room, was planning on buying the app for £3 so I can cast to the chromecast in the bedroom, but will look at Allcast before I do. Our new Sony telly is supposed to do this kind of stuff, but it fails miserably. Looking forward to seeing if Google’s device works as others say. Would promise to report back here, but I know I won’t.